If you're dorm shopping on a budget, you'll still need some useful dorm organization products. When it comes to storing dorm supplies, no space is more useful than that area underneath your dorm bed. Don't let that space go to waste! 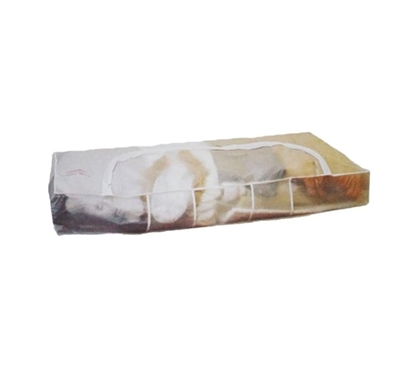 Grab some underbed dorm organizers like this Basic Underbed Storage Bag to store extra clothes, school supplies, and whatever other college supplies you'll need to store. Since this underbed organizer bag is made from see-through material, you won't have to guess what's inside. This is a practical feature, as it's easy to forget what supplies for college you even brought with you! Since this organizer for dorms is such a cheap dorm product, you'll have more money to spend on more fun dorm stuff and things you can keep inside this handy zippered bag. Whether it's more clothes or some other cool dorm accessories, save your money for cool dorm stuff. Of course, that doesn't mean you should neglect practical dorm necessities like organizational products. Being smart while shopping for college means searching out dorm products that are cheap but useful. If you include this organizer bag, you can rest assured that it'll fulfill both of those qualities.